Thomas was born c.1600 and he married Susan Morris c.1625. Susan was from Glankynlleth, Denbighshire and the daughter of David Morris of the same place, who married one of the daughters of Thomas Kynaston and Margaret Stanney of Morton, Oswestry, Shropshire – they married at Oswestry on 23rd July 1581. The daughters of Thomas and Margaret, all baptised in Oswestry, were Elizabeth, 26th June 1582; Dorothy, 18th July 1583: Ellena, 13th July 1584: Margaret, 3rd September 1585 and Sarah c.1588: There was one son, Roger, baptised on 14th March 1585. Margaret was the daughter of Richard Stanney of Oswestry and Thomas the son of Roger Kynaston and Gwen ferch Maredudd, grandfather also of Thomas Kynaston borne 1600. According to the 1634 Visitation to London, Thomas was then of London, a Marchant (Merchant). The Visitation takes the family back from Edward and Thomas, sons of Thomas and Susan, to Sir Roger Kynaston of Hordley (1425-1496). 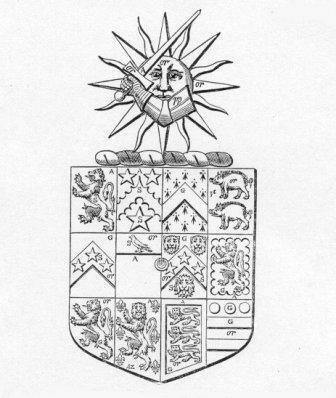 Not all the attributions tie up with the 1623 Visitation to Shropshire, wherein the Kynaston Hordley Coat of Arms is described slightly differently – see Sir Roger Kynaston - 1433. The names Pearle and Wake do not appear in the ancestry. Mary Kynaston baptised on 25th July 1626. She died shortly after birth and was buried at St Antholin on 2nd August 1626. Thomas’s Will was written on 13th April 1652. He was a Linen Draper of London. He left to his son, Edward, rents of £30 per year paid quarterly and to his son Thomas the balance of his land and hereditaments. Thomas, of the Parish of St Antholin, was appointed Executor and the will was proved on 29th May 1652. Thomas was buried at St Antholin on 7th May 1652. The data on Thomas, Susan and their children comes from the 1634 London Visitation, St Antholin Parish Records and the Thomas Kynaston/Margaret Stanney data from the 1623 Visitation to Shropshire.